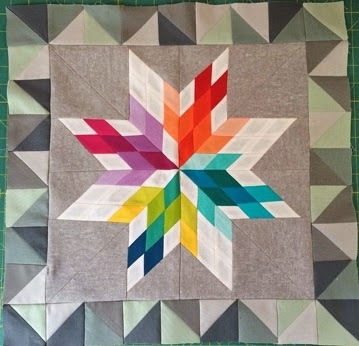 The Restitcherator: Aviatrix Medallion QAL - Progress is Amazing! Aviatrix Medallion is a pattern by Elizabeth Hartman. I loved this pattern from the moment I laid eyes on it. 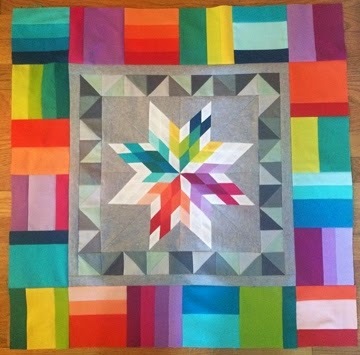 The rainbow color spoke to the 80"s child in me and said "you NEED to make this rainbow quilt". When I saw that they had a kit and Quilt-a-long at my local quilt shop (Sew Inspired in Simsbury, CT) I went and bought one right away. It's just piecing I told myself...yeah, a LOT of piecing, but I can do that. Maybe. Not so much. UGH. Thank GOD for the first class...The instructor went over the cutting for the center piece in great detail, noting that although you got a fat quarter for each color, which is what the pattern called for, you needed a FULL, EXACT fat quarter. If it was a hair short or crooked, you had to get clever with your cutting. I tried to take a lot of pictures as I went along. The diamonds were much harder to line up than I thought...and every single one of the eight had to be ripped out at least once. I used the templates in the pattern. My cutting techniques and precision need improvement. Much pulling and creative pressing ensued. This project has been a lesson in patience. And also, in taming my perfectionist shrew. I only tore the center out once, and I am honestly really happy with how the points came together in the very center. Look at my points in the center! I absolutely love the grey fabric that was included in my kit. It's got this amazing texture, it's not a quilting cotton. I'll have to ask exactly what it is next time I'm at the shop. It was so much fun to put the first colored border on. It really started to feel like the rainbow explosion I was looking for. 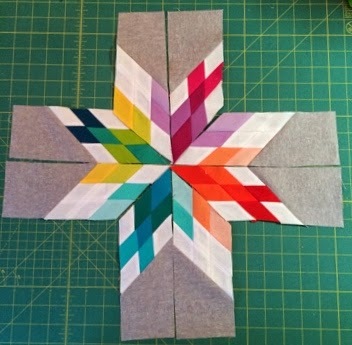 Although the fourth border was a great deal of piecing, it was also sort of addictive. 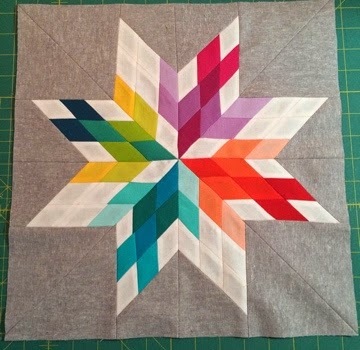 I wanted to actually see the blocks finished, and I was chain piecing a lot of it, so I didn't get to see what they looked like until the end of the month. As my Aunt Pat says, "the pattern is beginning to emerge". It's so big now, I have to take it outside to get good pictures. It was very grey the day I took these. This is a close up of the grey ("neutral") squares for Border #5. When you sew them on, they're rectangles, and I was sort of surprised they actually came out like the pattern said they would. I went to the class today as a drop in. They went over the next two borders. The final border set is the butterflies, which will challenge my ability to do angles again. 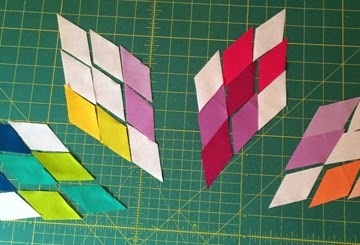 They are also TONS of piecing, wish me luck in keeping up! At the end, I'll try to include some pictures of the other color/fabric options people in class chose. They are all spectacular.